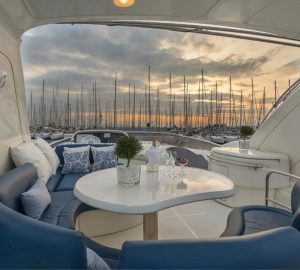 The Sicily based Azimut 74 has a wide, refined and elegant saloon with comfortable circular leather couches, large windows allowing natural light and a relaxed dining area. 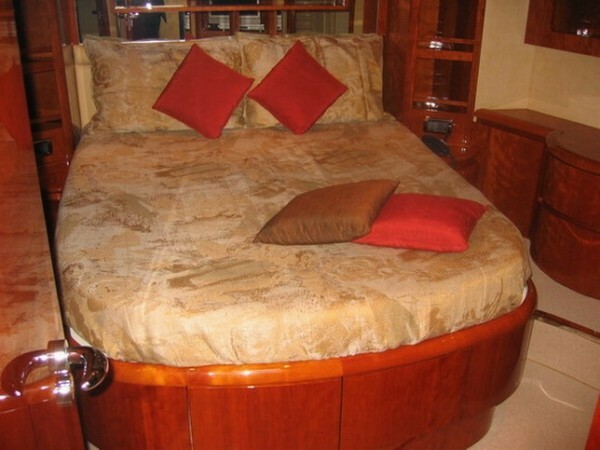 The motor yacht boasts the latest technology including a Sharp plasma TV, Bose Home Cinema, DVD, CD stereo, The well equipped galley has a dishwasher, washing machine, dryer, fridge and ice maker. 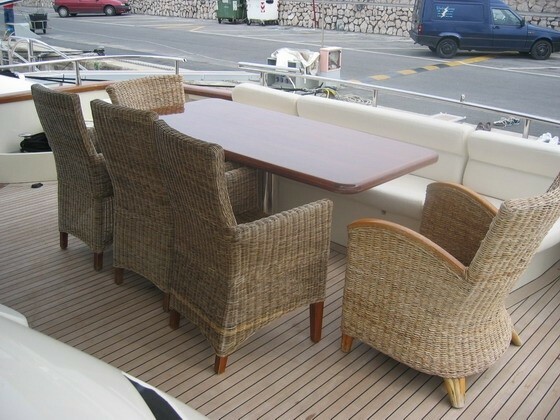 The external layout offers a spacious cockpit with dining table for el fresco lunches and evening meals. An extra sunbathing area with comfortable cushions can be found forward. 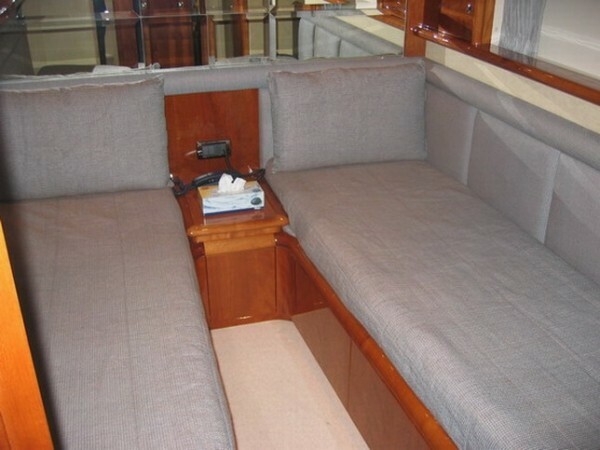 The fly bridge has a further dining table, settees and grill and a comfortable bathing platform. 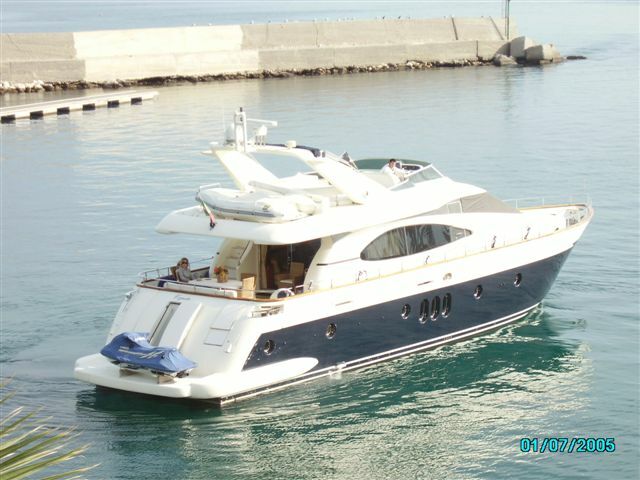 The Azumit 74 COPIA 3 can accommodate up to 10 guests in 4 cabins. 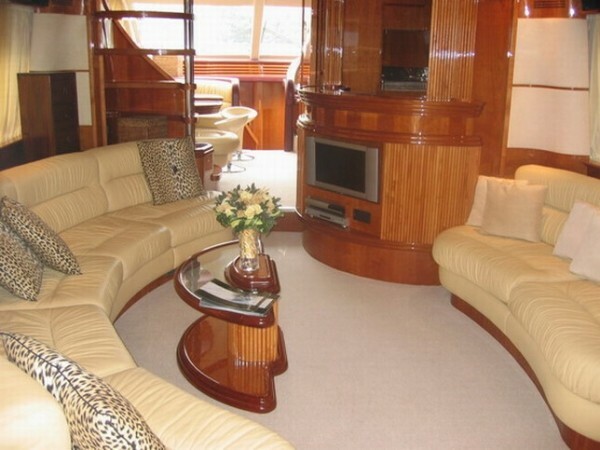 Both the Master cabin, located amid ship and the VIP cabin, located forward are the full width of the beam and have central double beds, each with en suite bathroom, Sharp plasma TV, Home Cinema, DVD, CD stereo. 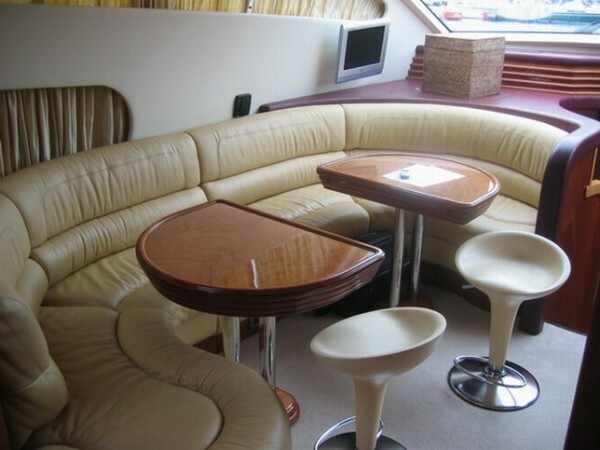 Two twin cabins each have an additional Pullman bed an en suite bathroom and Sony CD stereo. 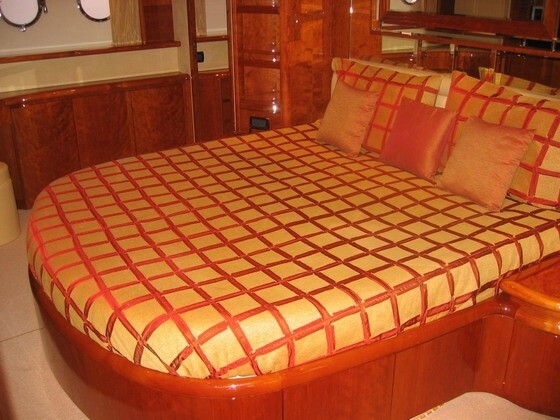 The 3 crew have separate quarters astern. COPIA 3 is ideal for two- three couples or families with children. 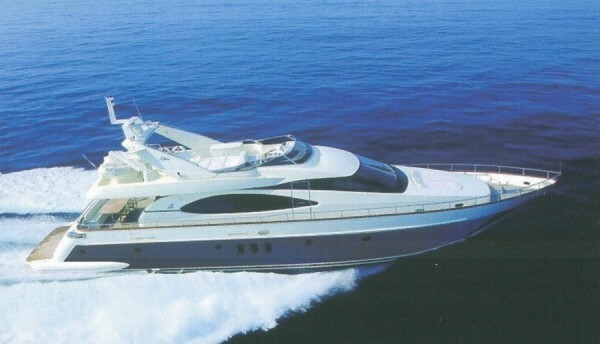 COPIA 3 is provided with the most modern navigation instruments and each comfort for her guests: SHARP plasma TV in saloon, BOSE home cinema CD/DVD system with surround sound in saloon, SHARP plasma TVs in master and VIP cabins, Home cinema CD/DVD system in master and VIP cabins, SONY CD stereo systems in guest cabins + crew cabin. 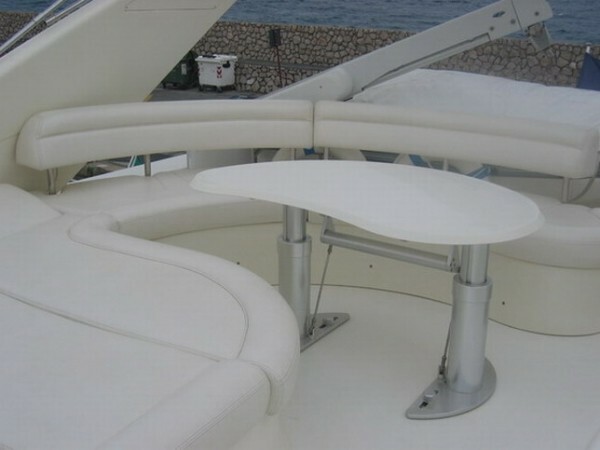 Wetbar and BBQ grill on flybridge. 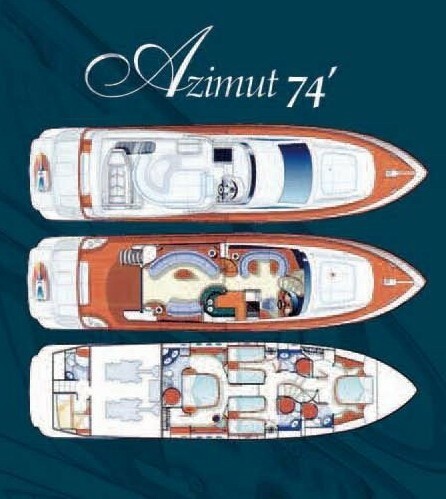 The Azimut 74 also offers a 3.20 mt Hydrojet dinghy with 100CV engine and jet ski 60 Cv.